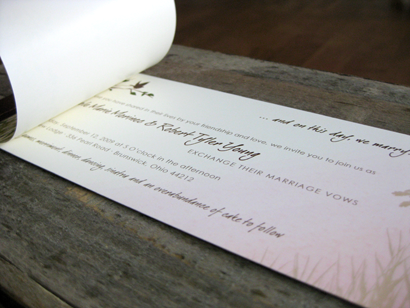 Having spent ten years of my life as a Graphic Designer, creating my own wedding invitations was something I both longed for and dreaded. So many ideas, so many possibilities, everyone expecting something fabulous from you – the pressure! But, ultimately, it is really fun and rewarding that I have been able to create so many elements for my wedding myself and in the end, after a week of agony, I am very pleased with how the invites came out. …and on this day, we marry. We then included the date (September 12! ), time and location and ended with my favorite part: Yard games, merriment, dinner, dancing, sinatra and an overabundance of cake to follow. And when I say ‘overabundance’, I really do mean it. For those who have not seen my previous posts, we are having an entire table of cake! Eight different ones to be exact, in six different flavors, each on its own pretty little cake stand, all lovingly baked by two amazing friends. Of course I’ll be sharing pictures! Back to the design, I next focused on the physical format of the piece and, initially, all I knew was that I wanted to somehow stitch the invitations together! The invites were printed digitally at a company I used to work for. Digital printing is a good, affordable option for printing in full color. The quality is not as good as when you print on an offset printing press, but the cost is about 1/8 or so in comparison, especially when you only need a small quantity of something. 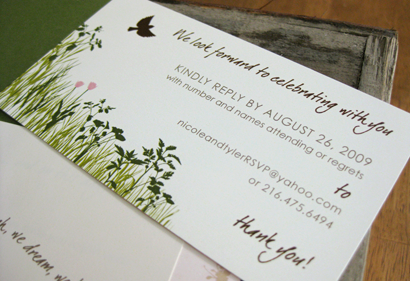 For the RSVP, I created a small card which included an email address and phone number for responding. Since things are on the casual side, I thought this was an appropriate option. It also saves money on an rsvp envelope and postage, and also saves time. I designed a wrap around label for the mailing envelope and printed them on my inkjet printer. The return address is on the same label and wraps to the opposite side of the envelope. I found it to be an easy way to print the labels and I really love the look of it. I ordered the open end #10 envelopes from Paper Presentation, but you can also find a great selection of colors at Paper Source. I ordered full sheets of ivory label stock from Labels by the Sheet where you can also find many other great colors if you are looking for something other than standard white. So what do you think?! These are absolutely gorgeous! And you can tell that a lot of time and love has gone into them! I think people will be stunned at their beauty when they get one! Lovely, unique and original. I love them! They are absolutely beautiful, very stylish and romantic and the idea of sewing them looks great. Those are absolutely beautiful. Very unique and special. SO awesome. Love it. As a designer who dreaded my wedding invitations so much that I went with something totally standard I really appreciate all your work. These came out beautifully and you really should be proud of yourselves!!! They are gorgeous!! Only a designer can understand the pains of designing for yourself… your TOUGHEST critic! These are so pretty Nicole! You did such an amazing job, just looking at them, you get the exact feel you were describing. Wow! Your invitations are gorgeous! Well worth all the time and stress. I have invitation envy :). When we got married four years ago, I really didn't care about the invitations. I whipped them together and put them in the mail. Since then, my creativity and imagination has kicked in, and I cringe when I think about those invitations. Oh well. Oh WOW!! Nicole these are stunning & I love every aspect of them! 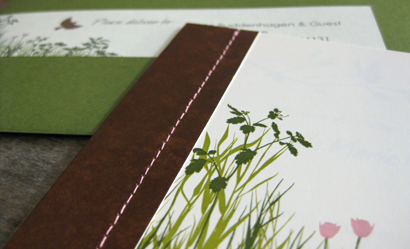 You could make a pretty penny designing custom invites for all sorts of occasions. 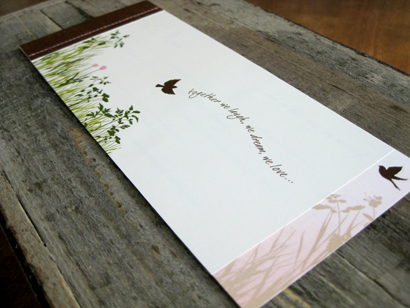 I love the bird and grasses picture on them. Truly beautiful Nicole. Interesting…I went with this size invitation 31 years ago…I just loved the simplicity and the look! Oh my goodness!! Those are amazingly fabulous and now I'm ridiculously envious…every detail is so gorgeous. I love the stitching (great job, Tyler!) and the wrap-around labels, especially the labels. And I also really enjoyed reading the “reception” details. =D Super great job with those, Nicole! i love them! fantastic! i understand the pressure, my husband is an artist/designer and i've always worked in design, so it felt like we were put to the test to design our wedding invites 🙂 i love the colours you chose, and the design is fab. you definitely rose to the occasion! They are absolutely BEAUTIFUL Nicole! Wow. Your wedding is going to be so special! Nichole, these are fabulous. The design and wording is lovely and “overabundance of cake” is my favorite part. Glad your man helped – that's a good sign. Congratulations on the design and on getting married. When's the wedding? You are all about sweet perfection. Charming and lovely! 'overabundance of cake'~love it! 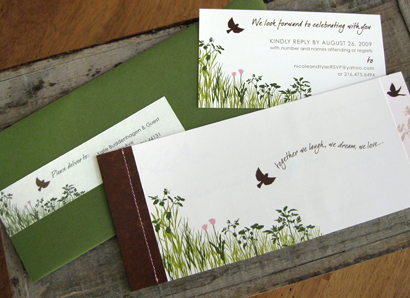 Beautiful invites, Nicole! Absolutely stunning, and perfectly fitting. Bravo! Those are absolutely gorgeous- professional and with a little handmade touch. Just perfect! I wish you both the best on your wedding day! BTW, I felt the same way with my wedding dress as I was in the Fashion Design business and I designed and made my own. In the end I got just what I wanted and it worked out great. How awesome, Nicole! These are beautiful. I love the unique touches (and would really like to witness, er, taste the overabundance of cake) and all of the details. Can't wait to see more! Nicole, these are gorgeous! I'm really inspired! GREAT idea on the rsvp method. It really is modern and easy for your loved ones this way. Everyone is on board these days with savings resources. Absolutely awesome! So wonderful that you created something original for your Big Day rather than picking something from a book! Very pretty invites. Congratulations on your wedding. I hope today was everything you wnated it to be and more! 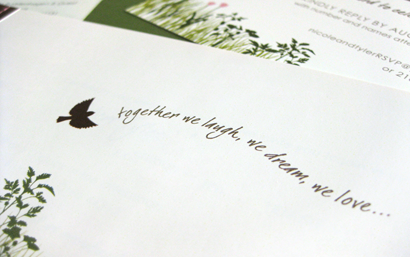 Have you thought of designing invites? I love your ideas & I'm planning my wedding for next September! I spent about 10 years of my life as a graphic designer and did design many invites through those years – its a lot of fun! Id love to help you out when you are ready if you'd like – just shoot me an email! Do you mind if I which program you used for designing them ? I love doing stuff like that by hand but I dont know what it would look like if I scanned/copied/photographed it and then printed it .. Could you give me a tip ? That would be truly awesome! Thanks for sharing your invitations! These are gorgeous! May I ask where you got the paper that is used for the wrap-around tab? I like it a lot!